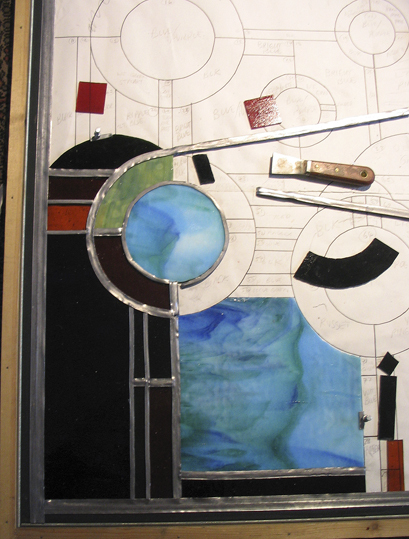 Two photos above showing a recently commissioned 3′ x 2′ stained glass panel under construction. These images are at the leading up stage. 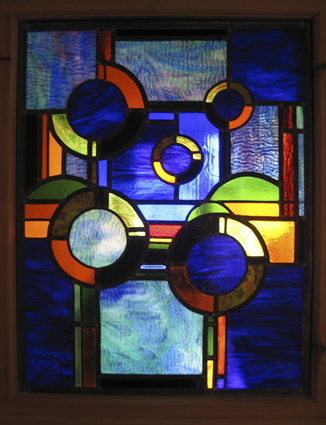 The cutline pattern can be seen beneath the glass. The design was created entirely in photoshop using collage techniques. The cutline pattern is scaled up from the design. 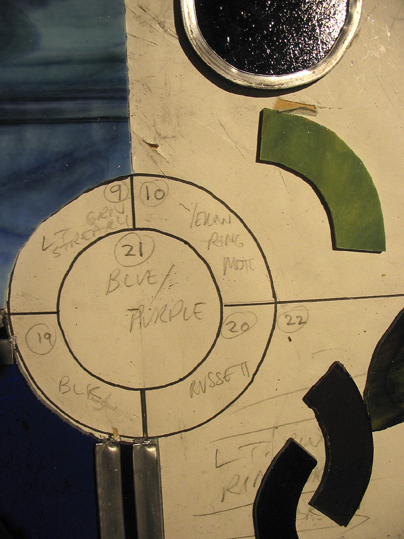 It is annotated with the number, colour and type of glass for each specific position. The photo on the left shows the panel growing at approx. 45 degrees from the bottom left corner using the L shaped edging batons to work up against. Traditionally horse shoe nails are used to temporarily hold the panel together while under construction. In this case modern glazing tacks have been substituted. The lead is called ‘came’ and comes in an ‘I’ section; the vertical called the ‘heart’ and horizontals known as the leaves. The leaves are gently lifted using a lead knife or a wooden/plastic fid to accept the glass, which fits snug up to the heart of the came. 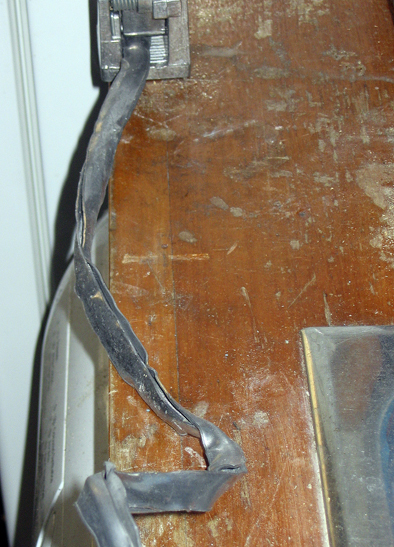 These photos show before and after the work hardening/straightening of the lead. The came arrives from the supplier, all twisted and buckled due to coiling, a method of space saving for transit. This is a shock if your unfamiliar with the recovery achievable. The came looks unusable. 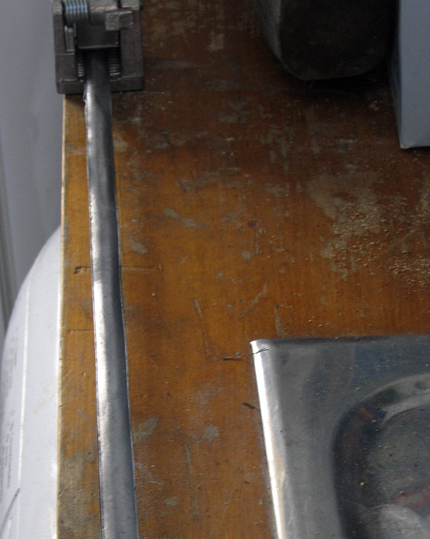 One end of the lead is placed in the grip of a special lead vice and the twists are unraveled. Gripping the lead in pliers, it is stretched. This miraculously straightens and work hardens the lead making it easier to handle. See straightened lead in photo on the right. 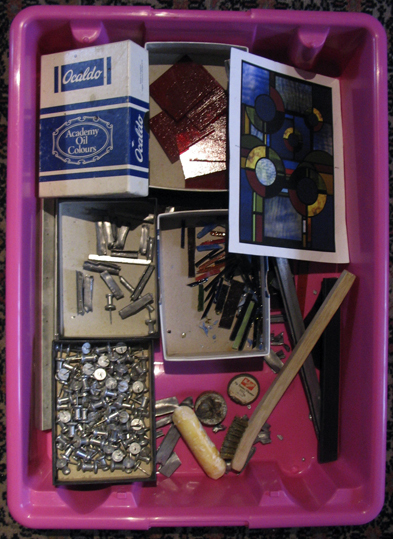 The above photos show the panel with its joints soldered and a tray of tools. A printout of the design for quick reference can be seen in the tray along with glazing tacks, brass bristled brush and a tallow candle. Each joint is cleaned with the brass brush and then fluxed with tallow. A 100w soldering iron is used to dab melt blowpipe solder onto each joint. The leaves are then lifted and puttying up is done to consolidate the glazing. Leaves are smoothed down, excess putty removed and then the panel is flipped to allow the same process on the back. Apart from the metal frame support the panel is complete. The re-bar is held in place by copper wire twist tags soldered into place at an existing joint point. 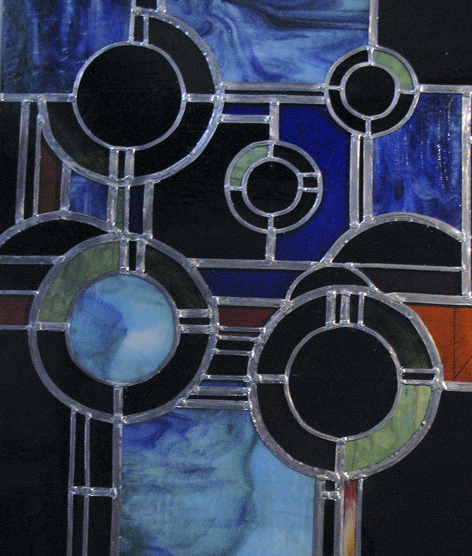 The photo below shows the finished panel installed in the window reveal, awaiting final fixing. A single sheet of float glass will be installed to sound and condensation proof from utility area beyond. Eagle Eyes was a type of Action Man I had as a kid. Only got the head left now. Body missing in action. Eagle Eyes got his name from his ability to scan the horizon with those big blue eyes by moving a lever from side to side in a slot at the back of the head. Takes me back to grappling hooks made from hair pins and string used to scale the fireguard. Ace! As mentioned I have still got the head and a wooly jumper (Action Man size) made by me Mum (x). The picture and post seems to be a little tribute to the survival of children’s artifacts/toys through the battles of childhood and beyond to the Elysian Fields of grown up treasures… Bliss! The print is gently rolled to post in a tough, plastic capped postal tube, 4″ dia.To order please contact. 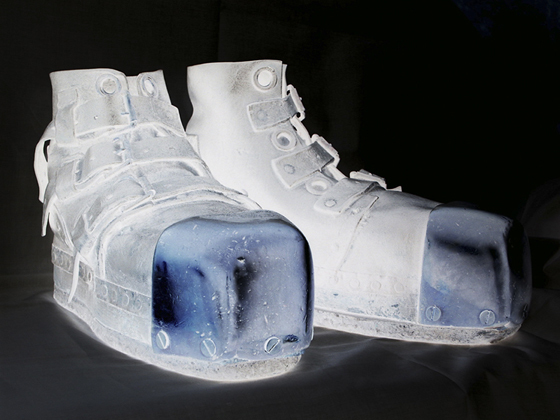 The ghostly ‘Ice Diving Boots’ print now available. * Limited edition of 1/12. Numbered and signed in pencil by artist. 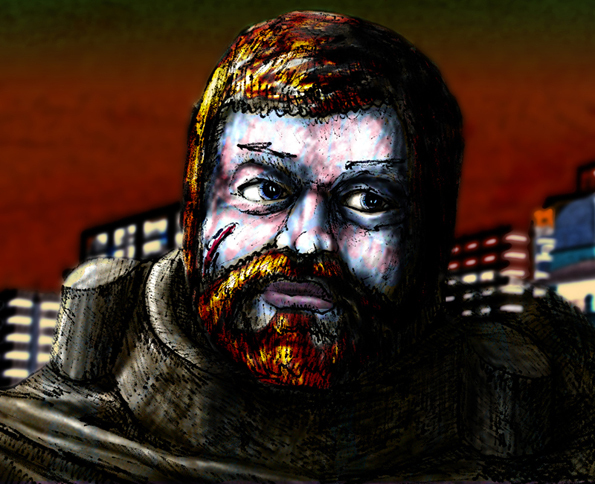 You are currently browsing the David Maddrell weblog archives for May, 2007.